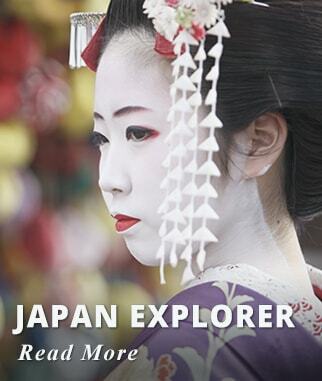 A two-week-long tour is visiting some of the most historically and culturally significant Cities that Japan has to offer. In Tokyo stroll through Asakusa and the Buddhist Temple of Sensoji, the fashion Mecca of Harajuku, the world's largest fish Market at Tsukiji or the lively atmosphere of Shinjuku and be captivated by Japan's most famous City. Travel by train to Hakone famous for its hot springs and the view of nearby Mount Fuji. Explore the mountain town of Takayama traditional home of merchants and sake brewers who have preserved their traditions for many generations. Visit Kanazawa a city with many historical attractions such as restored residences and districts, as well as modern museums. Kanazawa's main highlight is the beautiful Kenroukuen Garden. Continue to Hiroshima most well known for its destruction when the first Atomic Bomb was dropped over the City during the Second World War in August 1945. Take a trip to nearby Miyajima an Island considered being one of Japan's most scenic spots. Kyoto is a must-see destination in Japan. A City that takes you back in time to Japan's mysterious past, a place that offers a plethora of Temples, Shrines and other historically priceless structures that will survive today. End your Japan journey with a train trip to Nara accompanied with a local Guide; Nara was the capital of Japan during the 8th Century, and you can still admire many of the Temples and Shrines from that time. 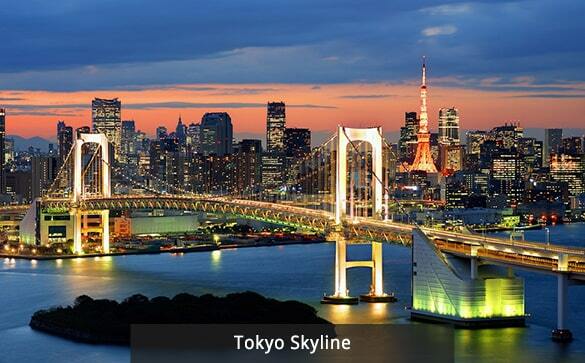 Board your International flight to Tokyo, we offer departures from most major cities in Canada or USA. Arrival in Tokyo Narita Airport, proceed to clear Customs and Immigration. You will be met in the arrival hall by a Destination Asia representative who will assist you with your Hotel transfer. You will be also be given an orientation about your Japan Rail Pass. Japan Rail Pass is booked for you prior to departure; But has to be exchanged for your Train Tickets by visiting the Japan Rail Office and presenting your Passport. Accommodation: Villa Fontaine Shiodome Hotel or Similar. Upgrade at an extra cost to: 5* Hilton Tokyo. Activities included today: Rest of the day at leisure. 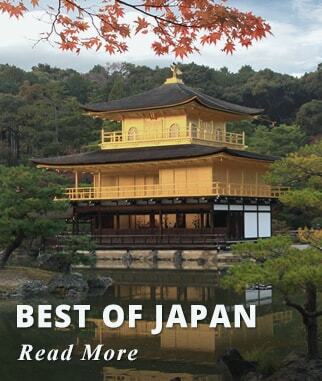 After breakfast enjoy a half day morning tour of Japan's fish Market and a Japanese home. The world's largest fish market, Tsukiji Market handles about 2,888 tons of marine products a day. Some 450 kinds of fish are received; from penny-per-piece sardines to golden brown dried sea slug caviar. Take time to wander through this enormous market, exploring both the vegetable and fruit areas plus the impressive seafood section. There may also be an opportunity to see a complete tuna being cut and filleted. You will then visit a typical Japanese home. Your guide will answer all your questions about Japanese culture and everyday life in Tokyo during the transfer by public transportation. Learn to prepare different kinds of sushi. You will then get to enjoy your homemade sushi for lunch. Tour ends in central Tokyo. The afternoon is at your leisure. Return on your own to the Hotel. Activities included today: Enjoy a Full Day Shared Coach Tokyo Tour. After breakfast take a Shared Coach Tokyo Guided Tour. Pick up/Drop Off at a Designated Spot. 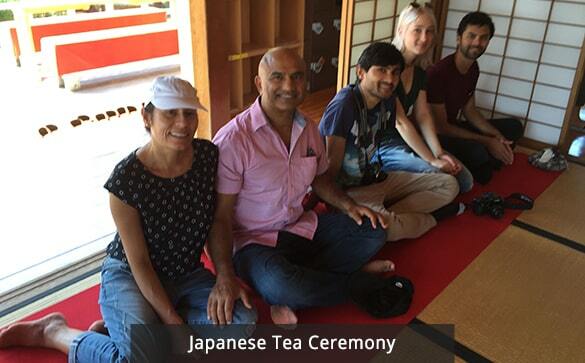 Enjoy a panoramic view of the city from Tokyo Tower before participating in a traditional Japanese Tea Ceremony. Savor lunch at a typical restaurant, then take a stroll along the moat surrounding the Imperial Palace Plaza. Board a cruise at Hinode Pier for a 40-minute trip up the Sumida River to Asakusa. Browse the many colorful stores lining the Nakamise walkway leading up to Sensoji Temple, Tokyo's oldest and most famous Buddhist temple, before driving through Ginza, Japan's world-renowned shopping and entertainment district. After breakfast travel by Train to Hakone the gateway to the Mt. Fuji region. Upon arrival transfer to your hotel and enjoy the rest of the day free to explore the City and explore this stunning region. Ride the world's second longest cable car to the top of Mt Owakudani, passing over the pools of boiling hot water belching steam, giving the mountain its name "Hells Valley". At the top, you can sample a black egg, cooked in the hot springs and said to add 7 years to your life. 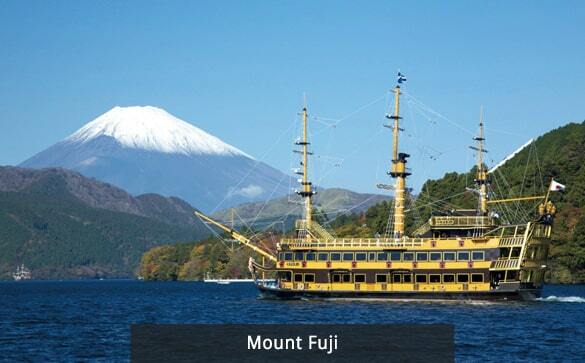 A majestic replica pirate ship will sweep you across the volcanic Lake Ashi, so deep it never freezes over in the winter. You can also ride switchback trains, ropeways and buses to explore some of the museums, shrines, and shops scattered around the area. You will stay in a Japanese traditional ryokan, sleeping on futons laid out on tatami mats with delicious meals and piping hot Onsen (hot spring) baths. Accommodation: Yutorilo An Ryokan Hakone. Activities included today: Travel by Train Tokyo - Hakone. Explore on your own. 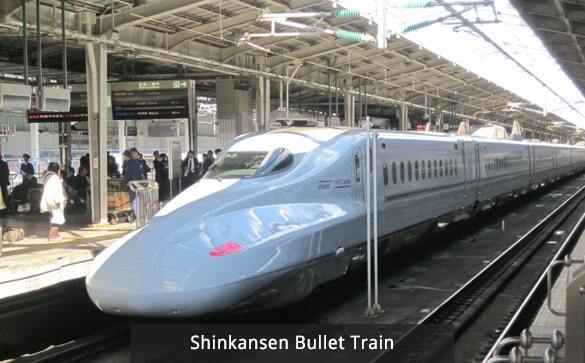 After breakfast take the world-famous Shinkansen bullet train, reaching speeds of up to 300km/h. You will then change onto the Limited Express Hida Wideview for one of the most scenic train journeys in Japan; winding your way through tall mountains and stunning gorges to Takayama. This afternoon we recommend visiting one of the town's many sake breweries for a taste of the local drop, its high quality ingrained in the area's clean water sources. Accommodation: Best Western Takayama Hotel. Activities included today: Travel by Train to Hakone - Takayama. Explore on your own. After breakfast, we recommend you head up to the Miyagawa morning markets which sell local crafts and produce. This is a great opportunity to try some of the region's delicious fruit and vegetables. A short bus ride will take you to Hida No Sato Folk Village, an open-air museum exhibiting over 30 typical farmhouses and other traditional buildings from the Hida region. A workshop in the village illustrates how many of Japan's famous handicrafts are made, including wood carving, tie-dying, weaving, and lacquering. In the afternoon, you can visit the Takayama Festival Floats Museum, displaying floats from the famous Takayama festival, or simply wander through the beautifully preserved old town. Activities included today: Day at leisure in Takayama. Explore on your own. After breakfast travel by Coach from Takayama to Kanazawa. Along the way you will stop in Shirakawago Village. An UNESCO World Heritage Listed Site, famous for its traditional Gassho-Zukuri farmhouses, some of which are more than 250 years old. Gassho-Zukuri translates as 'Praying Hands', as the farmhouses' steep thatched roofs resemble the hands of Buddhist monks pressed together in prayer, and are designed to withstand the heavy snows which fall in the region. After your visit, you will continue to Kanazawa by Coach. Accommodation: Kanazawa Tokyu Hotel Kanazawa. Activities included today: Travel by Coach Takayama - Kanazawa. Coach stops for a visit in Shirakawago Village. Breakfast at your Hotel. Enjoy a free day to explore Kanazawa. The highlight of any visit to Kanazawa is Kenrokuen Garden. We also recommend visiting Kanazawa Castle, located next to the garden. You can visit the Nagamachi Samurai District, the Saihitsuan Yuzen Silk Center - demonstrating the centuries-old Yuzen silk painting technique. And the Nomura Samurai House - a traditional Japanese home with a tea-ceremony room, an interior courtyard garden and artifacts from the Edo period. Activities included today: Free day to explore on your own. After breakfast Travel by train to Hiroshima (4 hours with one change in Shin Osaka). Rest of the day at leisure. The city's tragic past has become its biggest tourism attraction, and visitors from around the world now come to see the Peace Memorial Park and its haunting museum. Hiroshima is now the principal city of the Chugoku region and is home to over a million inhabitants who live in a municipality that boasts wide tree-lined boulevards and rivers. Accommodation: New Hiroden Hotel Hiroshima. Activities included today: Travel by Train Kanazawa - Hiroshima. Rest of the day at leisure. After enjoy a Shared Coach Tour of Hiroshima and Miyajima Island. Your Shared Coach Tour Stars/Ends at Hiroshima Train Station. It is ironic that the city's past tragedy has become its biggest tourism attraction and visitors from around the world now come to see the Peace Memorial Park and its haunting museum; an UNESCO World Heritage Site. 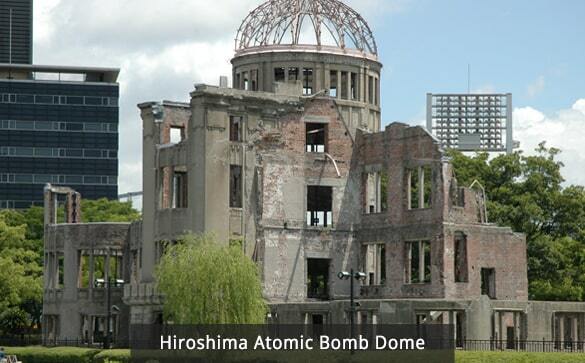 You will visit the Hiroshima Peace Memorial Park with the Atomic Bomb Dome. The area where the park now lies was ground zero for the Atomic Bomb on 6th August 1945. After the bombing the Memorial Park was created and dedicated to those who lost their lives in the attack. Stroll through the park and discover the many memorials, monuments and statues in the park before heading into the Museum itself. From Hiroshima, a short ferry ride will take you to Miyajima Island. A small sacred island located in the Inland Sea, it has been a holy place of Shintoism since the earliest times. 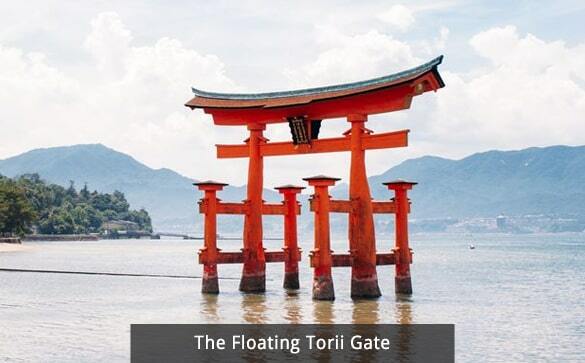 Here you will find perhaps the most photographed site in Japan - The Floating Torii Gate. Designated as one of Japan's '3 Most Beautiful Views', the shrine it belongs to dates back to the 6th century with the present structure dating back to the 12th century. The harmoniously arranged buildings reveal great artistic and technical skill, and have been designated a UNESCO World Heritage Site. Mere 'commoners' were not allowed to set foot on this holy place, and even now it is forbidden to give birth or die on the island! Activities included today: Shared Coach Tour of Hiroshima and Miyajima. From Hiroshimas Train Station board the Shinkansen Bullet Train as you travel to Kyoto; Duration 2 hours. This is a must see destination in Japan. 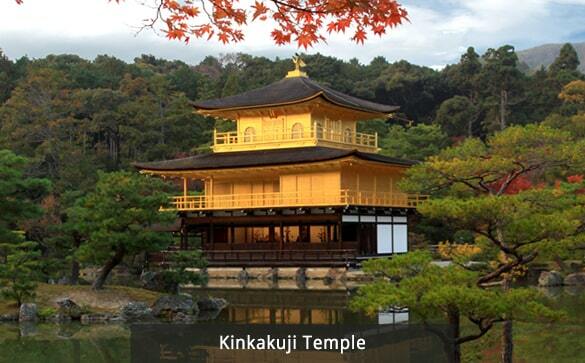 Kyoto is the nation's former capital and was the residence of the emperor from 794 until 1868. It is Japan's seventh largest metropolis with a population of around 1.4 million and a city of culture that offers a plethora of temples, shrines and other historically priceless structures that still survive today. Accommodation: Vista Premio Hotel Kyoto. Upgrade at an extra cost to: 5* Hotel Granvia Kyoto. 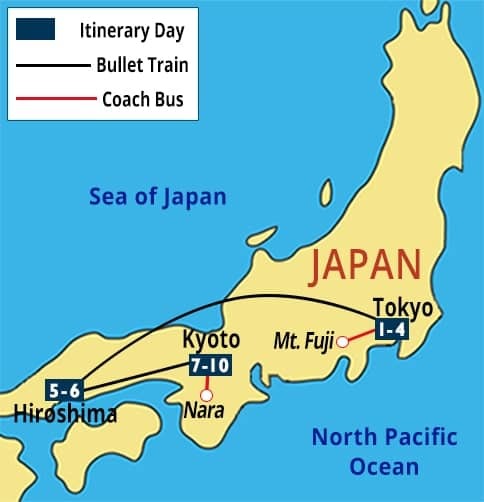 Activities included today: Travel by Bullet Train from Hiroshima to Kyoto. Today you explore the former imperial capital with a knowledgeable local guide, utilizing Kyoto's comprehensive bus system to visit some of Kyoto's World Heritage Sites. You will start your day with a visit to Kinkakuji Temple (Golden Pavilion), which was originally built as a retirement villa for the Shogun. After his death, it became a Buddhist Temple at his request, and is now one of Kyoto's most famous temples. Nijo Castle is an ornamental castle built by the founder of the Edo Shogunate as his Kyoto residence and is surrounded by stunning surrounding gardens. The main building was completed in 1603, and is famous for its architecture, decorated sliding doors and 'chirping' nightingale floors. Take a walk down Nishiki Market, a narrow, five block long shopping street lined by more than one hundred shops and restaurants. Known as "Kyoto's Kitchen", this lively retail market specializes in all things food related, like fresh seafood, produce, knives and cookware, and is a great place to find seasonal foods and Kyoto specialties, such as Japanese sweets, pickles, dried seafood and sushi. To end the day, you can decide what to visit. You may want to go to Kiyomizu (Pure Water) Temple. From the 13m high veranda jutting out from the Main Hall you can enjoy amazing views of the whole of Kyoto, whilst pondering the fact that both the Main Hall and Veranda were built without the use of nails or any kind of joiners; however, it is a steep walk uphill, and the temple is now under repair work, although it is still enjoyable and a Kyoto landmark. You may decide, instead, to visit Sanjusangendo, a temple which is Japan's longest wooden structure (120m). It is famous for its 1001 statues of Kannon, the goddess of mercy. In the center of the main hall sits a large, wooden statue of a 1000-armed Kannon that is flanked on each side by 500 statues of human sized 1000-armed Kannon standing in ten rows. Together they make for an awesome sight. Activities included today: Kyoto City Tour. Breakfast at your Hotel later head from your hotel to Nara by train (45min) with a local guide. For 74 years during the 8th century, Nara was Japan's capital and many of the temples and shrines built at that time remain. 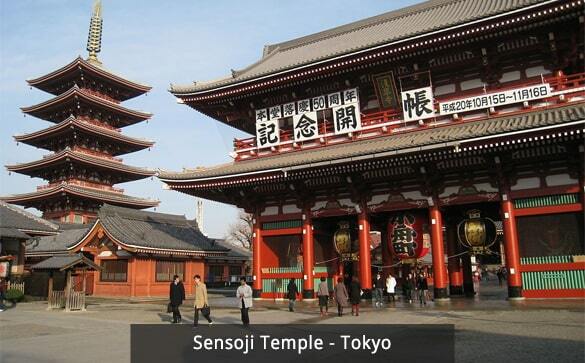 Visit Todaiji Temple, the world's largest wooden building and home to Japan's largest Buddha. Next stop is Nara's most celebrated shrine, Kasuga Taisha, established in 768 AD and famous for its hundreds of bronze and stone lanterns which have been donated by worshipers. Take a wander through Nara Park, called Deer park by locals, home to more than 1,000 tame deer. Upon returning from Nara, you can visit Fushimi Inari Shrine, used in the movie "Memoirs of a Geisha". 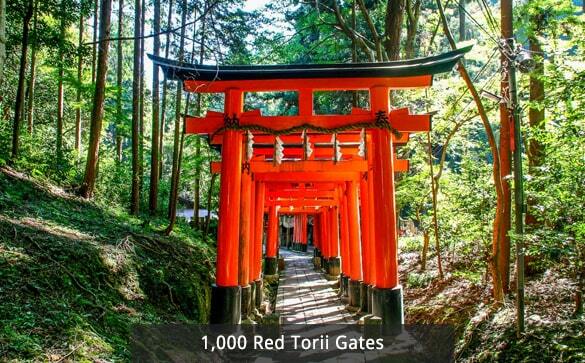 The shrine is famous for housing over 10,000 red torii gates, which form a path up the mountain behind the temple. Later depart by train Kyoto - Tokyo (approximately 4 hours). Connect with your departure flight. Three nights of accommodation at Villa Fontaine Shiodome Hotel Tokyo or Similar. One night accommodation at Yutorilo An Ryokan in Hakone. Two nights of accommodation at Best Western Hotel Takayama Hotel or Similar. Two nights of accommodation at Tokyu Kanazawa Hotel or Similar. Two nights of accommodation at New Hiroden Hotel Hiroshima or Similar. Three nights of accommodation at Vista Premio Kyoto Hotel or Similar. 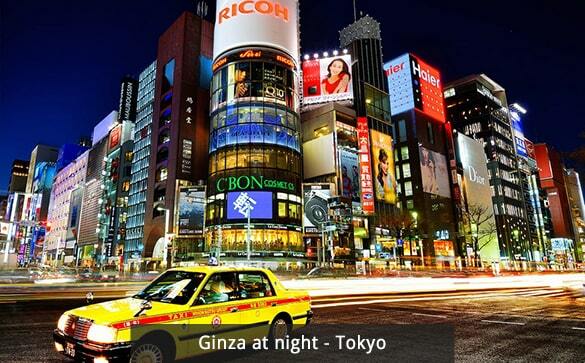 Full Day Shared Guided Coach City Tour of Tokyo. Visit Tokyo's Tsukiji Fish Market. Sushi Making lesson at a Japanese Home. Night stay at a Traditional Japanese Ryokan. A day at leisure to explore Hakone. A day at leisure to explore Takayama. A day at leisure to explore Kanazawa. 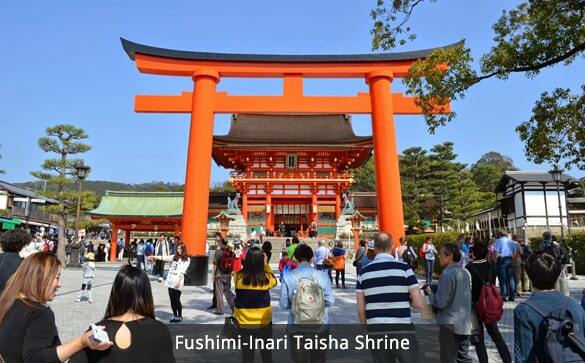 Full Day Shared Guided Coach Tour of Hiroshima and Miyajima Island. Cooking Class with a Kappo Chef at a Restaurant in Kyoto. 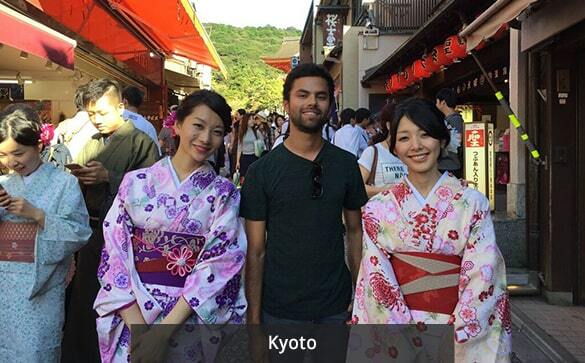 Full Day Shared Guided Coach Tour of Kyoto. Full Day Shared Guided Tour of Nara. Sightseeing provided by an English Speaking Tour Guide. 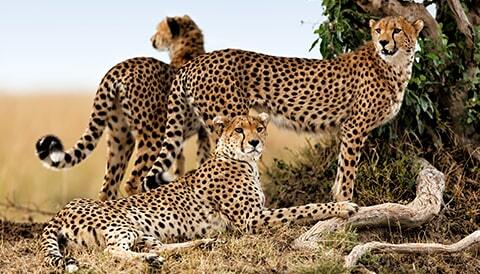 Shared Coach Tours depart either from your hotel or at a nearby point. 14 Day Japan Rail Pass Standard Class. 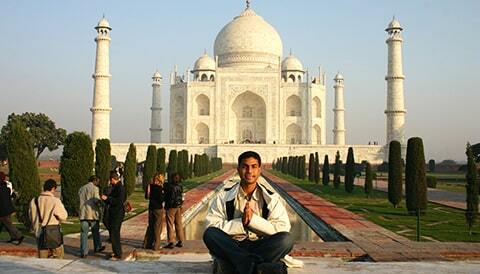 Customary tips to Tour Guides, Drivers, and Hotel staff.